Metal Garages Direct offers metal garages to the entire state of Tennessee TN. 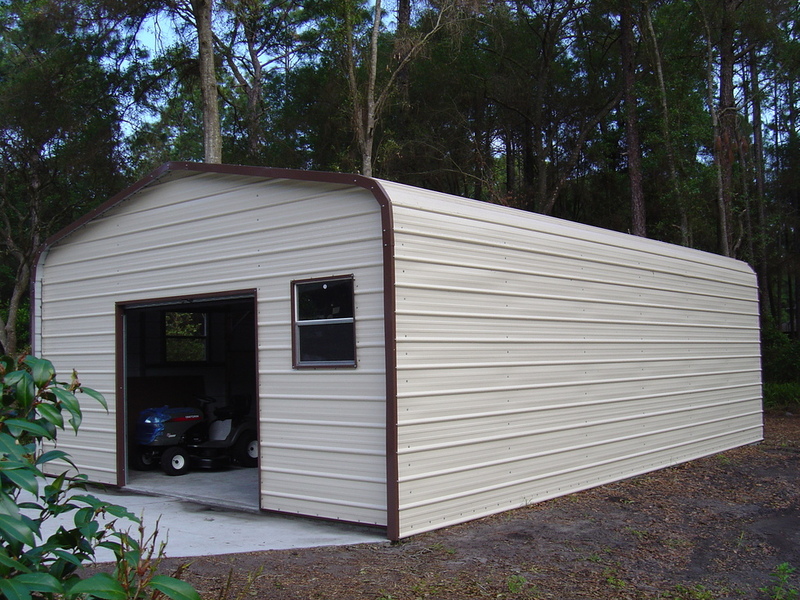 We offer our Tennessee metal garages in many different sizes starting at 12' wide up to 60' wide and as long as you want. Our garages are available in up to 16' side height. Our Tennessee TN metal garages are available in 13 different colors! In addition Tennessee TN metal garages are available in both 14 ga(no warranty) or 12 ga(20 year rust through limited warranty) and come standard with 29 gauge paneling, but are also available in 26 gauge(most states). Tennessee steel garages are available in both certified and non certified. We also offer carports, metal barns and steel buildings! Our metal garages are great for storing cars, trucks or tractors. A Tennessee steel garage helps protect your assets from mother natures unpredictable weather. ​Unlike most companies we display our prices for you to see so check out our garage packages below! Our Tennessee metal garages are delivered and installed for free as long as your ground is level. Our normal delivery time for Tennessee are is 2-4 Weeks and up to 8 weeks. So if you are looking for a great metal garage or steel garage at a great price with quality service then give us a call toll free at 1-877-662-9060 or email us: sales@mayberrymetalstructures.com. ​Adamsville TN, Alamo TN, Alcoa TN, Algood TN, Altamont TN, Arlington TN, Ashland City TN, Athens TN, Atoka TN, Bartlett TN, Bean Station TN, Belle Meade TN, Bells TN, Berrys Chapel TN, Benton TN, Bloomingdale TN, Blountville TN, Bolivar TN, Boones Creek TN, Brentwood TN, Brighton TN, Bristol TN, Brownsville TN, Camden TN, Carthage TN, Caryville TN, Centerville TN, Chattanooga TN, Church Hill TN, Clarksville TN, Cleveland TN, Clifton TN, Clinton TN, Collegedale TN, Collierville TN, Colonial Heights TN, Columbia TN, Cookeville TN, Covington TN, Crossville TN, Dandridge TN, Dayton TN, Decatur TN, Decherd TN, Dickson TN, Dover TN, Dresden TN, Dunlap TN, Dyer TN, Dyersburg TN, East Ridge TN, Elizabethton TN, Erwin TN, Estill Springs TN, Etowah TN, Fairview TN, Farragut TN, Fayetteville TN, Forest Hills TN, Franklin TN, Gallatin TN, Gatlinburg TN, Germantown TN, Goodlettsville TN, Greeneville TN, Greenfield TN, Green Hill TN, Halls TN, Hampton TN, Harriman TN, Harrison TN, Harrogate TN, Hartsville TN, Henderson TN, Hendersonville TN, Hohenwald TN, Humboldt TN, Huntingdon TN, Jackson TN, Jamestown TN, Jasper TN, Jefferson City TN, Jellico TN, Johnson City TN, Jonesborough TN, Kingsport TN, Kingston TN, Kingston Springs TN, Knoxville TN, Lafayette TN, La Follette TN, Lakeland TN, Lake Tansi Village TN, Lakewood TN, La Vergne TN, Lawrenceburg TN, Lebanon TN, Lenoir City TN, Lewisburg TN, Lexington TN, Linden TN, Livingston TN, Loudon TN, Lynchburg TN, Lynn Garden TN, Madisonville TN, Manchester TN, Martin TN, Maryville TN, Mascot TN, McKenzie TN, McMinnville TN, Memphis TN, Middle Valley TN, Milan TN, Millersville TN, Millington TN, Monteagle TN, Monterey TN, Morristown TN, Mountain City TN, Mount Carmel TN, Mount Juliet TN, Mount Pleasant TN, Munford TN, Murfreesboro TN, Nashville TN, Newbern TN, Newport TN, New Tazewell TN, Nolensville TN, Oak Hill TN, Oak Ridge TN, Oliver Springs TN, Oneida TN, Ooltewah TN, Paris TN, Parsons TN, Pegram TN, Pigeon Forge TN, Pikeville TN, Portland TN, Powell TN, Powells Crossroads TN, Pulaski TN, Red Bank TN, Ripley TN, Rockwood TN, Rogersville TN, Savannah TN, Selmer TN, Sevierville TN, Sewanee TN, Seymour TN, Shelbyville TN, Signal Mountain TN, Smithville TN, Smyrna TN, Soddy-Daisy TN, Somerville TN, South Fulton TN, South Pittsburg TN, Sparta TN, Spencer TN, Spring City TN, Spring Hill TN, Springfield TN, Sweetwater TN, Tazewell TN, Tiptonville TN, Trenton TN, Tullahoma TN, Tusculum TN, Unicoi TN, Union City TN, Valley Forge TN, Walnut Hill TN, Waverly TN, Waynesboro TN, Westmoreland TN, White Bluff TN, White House TN, White Pine TN, Whiteville TN, Winchester TN and Woodbury TN!